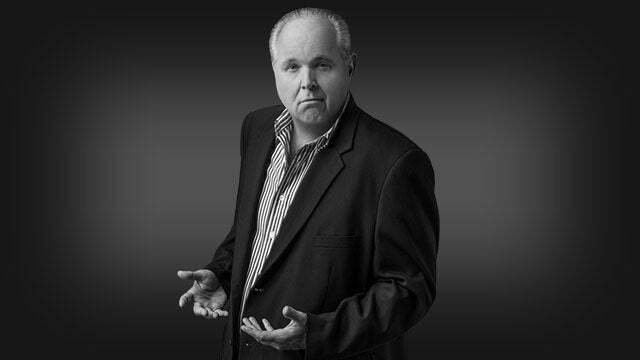 RUSH: Rush Limbaugh and the Excellence in Broadcasting Network. The nation’s most listened to radio talk show, the most talked about radio talk show. The talk show that blew up the Drive-By Media news monopoly starting in 1988. You know, somebody asked me the other day — and these kind of questions make me nervous. I don’t quite… (interruption) The screen saver again! I’m just… I’m sorry to be so distracted by this, but I’ve got… Hey, DirecTV! I love you. I really do. But could you fix it so the screen saver doesn’t activate every 20 minutes? Now what? Oh, well. Some kind of signal… Anyway. Somebody asked me the other day, “Have you ever thought about what would happen…?” It was the old It’s a Wonderful Life question. But I don’t think about it. At some point, the monopoly would be busted up. (interruption) You don’t think so? Snerdley is adamantly saying, “Nope. No way.” Well, it doesn’t matter. It was busted up, and they are fit to be tied. (interruption) Oh, come on! Trump wouldn’t have been elected? Come on. (interruption) Okay. Okay. Okay. Okay. That… (interruption) Maybe we wouldn’t have had the Congress in ’94. Maybe that. But this other stuff, you’re going a bit far. But, anyway, here we are.